When the new year came, so did the significant dip in temperature. It reached a cool 17.5 degrees Celsius in Metro Manila, which for our tropical country meant one of the coldest temps in recent history (mountain cities like Baguio, even registered 8 degrees). It also meant you didn’t have to turn on the air conditioning at home, you could take out those jackets out of your closet, and it was the perfect weather for a hot bowl of ramen. Just a few weeks ago, the weather went back to ‘normal’ (hello again, 30-degree weather), but this shouldn’t stop any self-respecting ramen fan to go out there and have a bowl or two, particularly when there are several relatively new players in the hot ramen scene in the metro. Here are two of them, which I’m finally getting to blog about. A three-decade old ramen chain from Osaka opened shop in TriNoMa mall in Quezon City late last year. It’s known for its Signature Happiness Ramen (P480), which is a big bowl of shoyu-tonkotsu broth and an even more overwhelming slab of slow-cooked pork rib. Quite a monster, that even the hubby, who can usually put away huge chunks of meat, found it too much. But don’t get me wrong, it was good, the broth was balanced and the meat, fall-of-the-bone tender and flavorful. Just order it when you’re hankering for meat and lots of it. What’s better than having ramen? Slurping ramen during a rainy day. Manila and many parts of the country have been inundated by rain since last month and aside from slurping local favorites such as sinigang, batchoy, mami, champorado and arroz caldo, the Japanese noodle dish is gaining more following in the country. While a few years back, Japanese restaurants serving good authentic ramen in Manila were not abundant, nowadays you could find one in most parts of the metro. 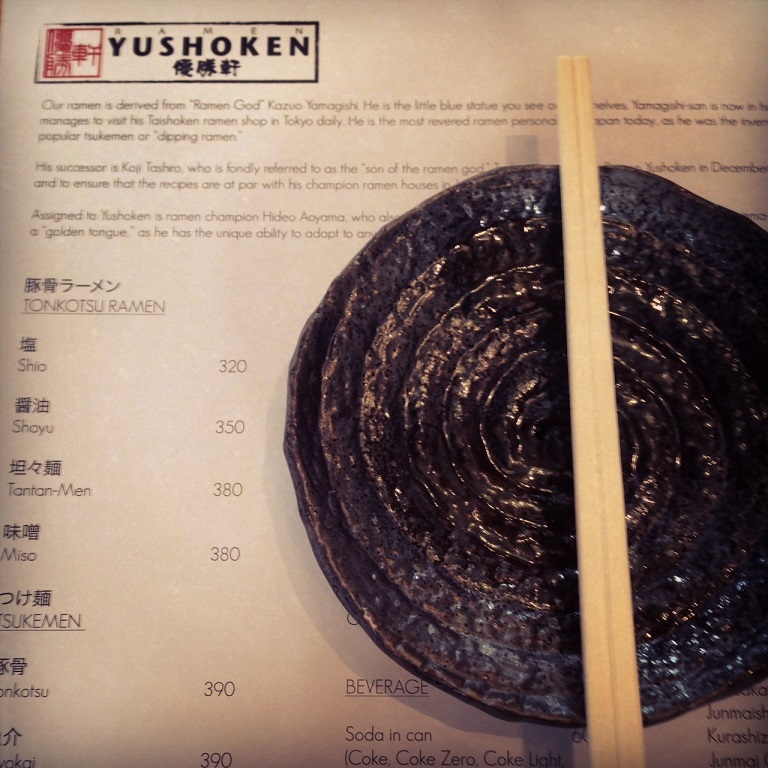 Take Ramen Yushoken in Alabang. Ramen Yushoken probably tops the list of ramen-ya these days. I know it tops my list. Before it opened, we were already hearing some buzz about it as restaurateur Elbert Cuenca had traveled to Tokyo to go and try bowls and bowls of ramen (lucky!). 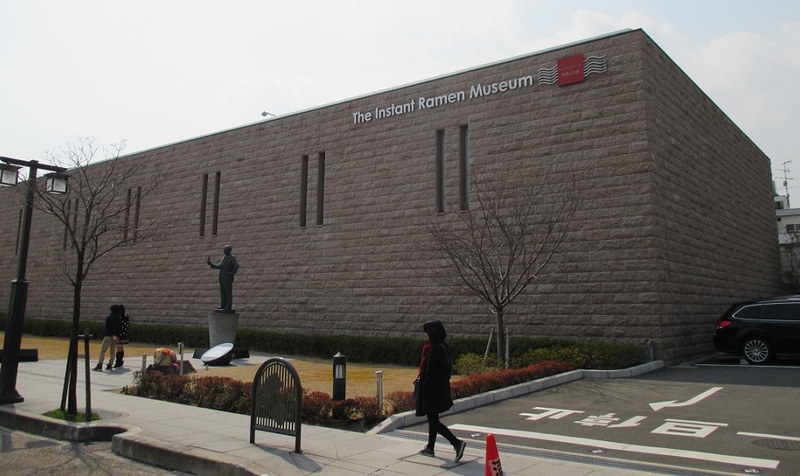 Months later he opened a ramen-ya serving ramen derived from Japan’s “Ramen God” Kazuo Yamagishi, inventor of the tsukemen (dipping noodles), proprietor of the legendary Taishoken ramen shop in Ikebukuro, and adorable-looking old man who regularly sits outside his restaurant. His successor (or “son of ramen god”) came to the country to make sure that the different varieties of ramen to be served in Yushoken are at par with ramen god’s champion ramen houses. What a build up, right? Since a queue often forms outside the resto during lunch and dinner hours, we were there even before it opened at 11 am. 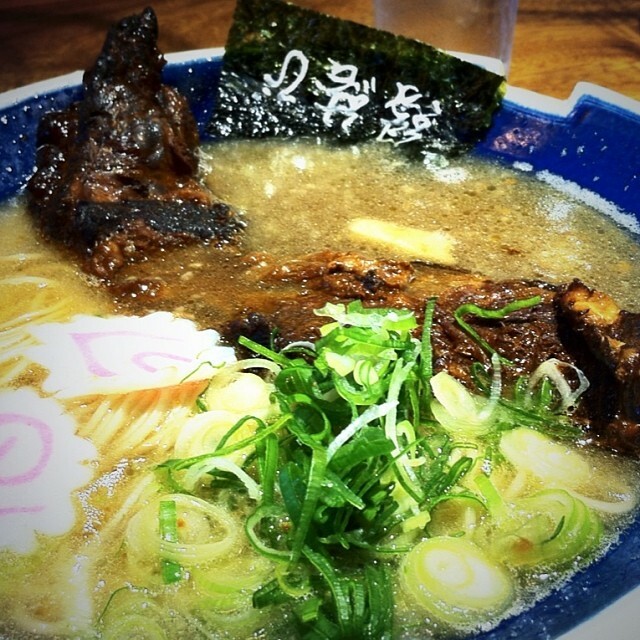 Yushoken serves ramen in a rich, thick tonkotsu broth base (made from boiling pork bones over several hours). Being a fan of miso (soy bean paste), I stick to my favorite even if it’s described as the most rich soup in the menu; the hubby got shoyu. When you’re traveling and you encounter a menu where you can’t understand single thing, do you a) make an attempt to communicate with the server with only four words you know of the local language , b) point at something in the menu and hope you don’t order something heinous, or c) try your luck in another restaurant with English translations in the menu? I’ve done all three: a) if I am feeling adventurous and , b) if I’m feeling extremely adventurous and c) when exhaustion dictates the need for something familiar and the the only adventure I want to have that day is figuring out the train route. In the trip to Hong Kong, a place where good food is abundant, I found myself making all three decisions. In the mornings, when P and I are eager to start our day and before we meet with our friends, we wake up early and explore the nearby streets on our own from where we were staying.